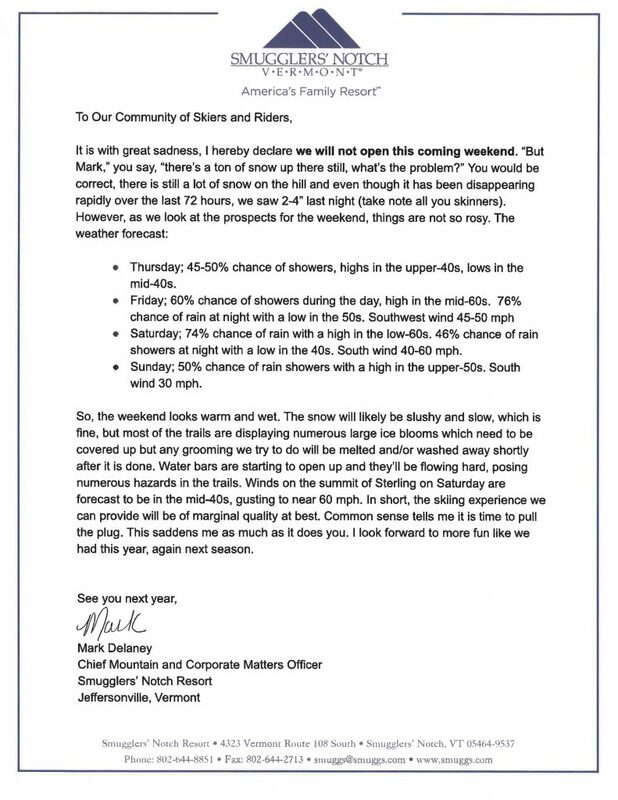 Important message from our Chief about the upcoming weekend. Doug, Dodi, and I enjoyed skiing the Alley and Highlander Glades. Rockin’ Ron for Hugh. 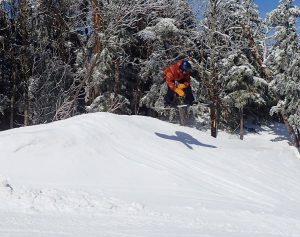 My friends Doug & Dodi Gomez were seizing the day at Smuggs! 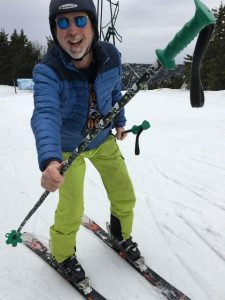 In ye olde Smugglish “Carpe Ski’em” means to “Skiis-the-day” or “Skiis-the-moment.” In other words “make hay while the sun shines” or “smoke ’em if you got ’em” for this could be the last day of the 2018-2019 Winter Season. On Wednesday – a determination will be made about lift operations for next weekend – check back for details. Yours truly and my Pirate Ski Poles. Rockin’ Ron for Hugh. 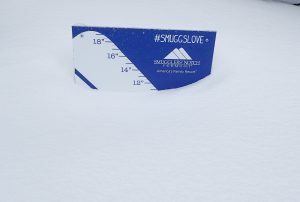 There will be spring skiing today, but temps dropped below freezing late last night and that means the groomers will be working right up until the time of the DELAYED LIFT OPENINGS: Sterling at 9:00 am and Madonna I at 9:30am. On Wednesday, a determination about the weekend’s lift operations will be made. Stay tuned skiers and riders. 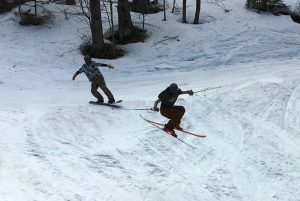 Catching air on Upper Exhibition! Bruce is Streaming Live! He catches air over water. Rockin’ Ron for Hugh. 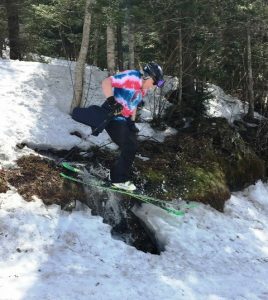 with temps reaching 60 degrees, there was bound to be some melting snow, a few streams, and great spring skiing! I got to make some turns with my friend Bruce Morrisey of smuggsphoto.com. Turnabout was fairplay – he was the subject and I took the photos. Upper FIS to Lower Doc’s was my favorite run of the day. 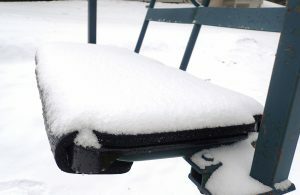 LIFTS & TRAILS: DELAYED LIFT OPENINGS on Sunday: Sterling 9:00 am, Madonna 9:30 am. Trail counts/grooming determined by conditions. We’ll be closed midweek, April 15th – 19th. On Wednesday, a determination will be made about next weekend’s lift operations. 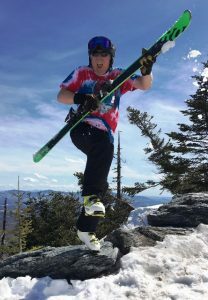 Spring Skiing makes Bruce jam for joy! Signs, signs, everywhere there’s signs… in this case, they point to fun on our upper mountains! MI and Sterling are operating today and 59 trails are open including Upper FIS, Doc Dempsey’s, Smugglers’ Alley and more! Spring conditions – be aware of changing surfaces. 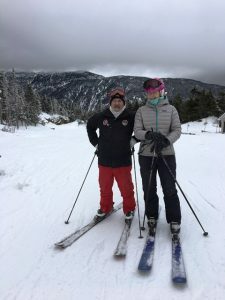 Dale & Darcy – longtime and frequent skiers. They are also talented musicians. Rockin’ Ron for Hugh. Despite the date on the calendar, conditions are GREAT! Therefore, many of the usual suspects were on the slopes. It’s always fun to hang out with Darcy & Dale and talk tunes and trails. At the Rumrunner-Black Snake intersection we conferred with Blinky and Dr. John, and their suggestion was Harvey’s to Full Nelson, and good advice it was. 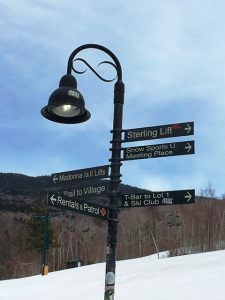 This Saturday and Sunday both Madonna I and Sterling will be operating with 50+ trails open for intermediates and experts. Expect spring conditions. We will be closed Monday, April 15th – Friday, April 19th and then RE-OPEN next weekend. On Saturday, April 20th we plan to operate both Madonna I and Sterling. On Sunday, April 21st, only the Sterling Lift will be running (loading for the Easter Sunrise Service is from 6:00 am – 6:30 am). This car has a License to SKI! Tomorrow we plan to have the Sterling lift operating. We have 31 trails open for intermediates and experts. Surface conditions are machine groomed and variable with average base depths of 18 to 48 inches. We plan to groom 9 trails tonight for a grand total of 36 acres of freshly groomed terrain. Today we have the Sterling Lift operating. We have 31 trails open with terrain for intermediates and experts. Surface conditions are machine groomed and variable with average base depths of 18 to 48 inches. 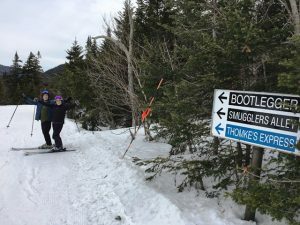 14 trails have been groomed for today, including Snake Bite, Smugglers’ Alley, Jolly Rodger, Thomke’s Express, and Black Snake for a grand total of 45 acres. We received 1 to 2 inches of new snow overnight and 378 inches this season so far! Today we have Sterling lift operating with 30 trails open. We have terrain for intermediates and experts. Surface conditions are machine groomed and variable with average base depths of 18 to 48 inches. 13 trails have been groomed for today, including Smugglers’ Alley, Jolly Rodger, and Black Snake for a grand total of 44 acres of freshly groomed terrain. Currently, is it snowing and 20 degrees at the summit of Sterling with winds of 10 to 20 mph. Today’s forecast is calling for a chance of snow showers early with temperatures between 23 and 34 degrees. Hello skiers and riders! Thanks for checking out my blog. 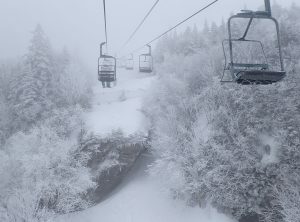 I've been skiing Smuggs since I was a young 'un, when my family moved to Vermont and made the resort a temporary home base. Full circle — now I'm introducing my own family to the mountain! 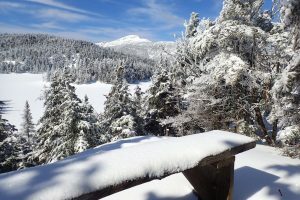 Each day you'll find an entry and photo on mountain conditions and happenings, highlighting the great terrain we have spread over three mountains and the awesome adventures that skiers and riders of all ages can have out there! You'll also hear from Rockin' Ron Carter a couple days during the week. 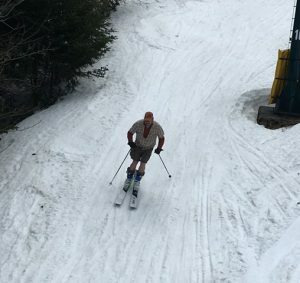 Maybe you'll spot him on his favorite run — Pirate's Plank on Sterling Mountain. We'll be out there on the slopes, and hope to see you — thanks for skiing and riding Smuggs! 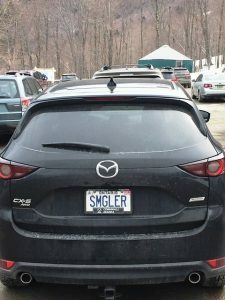 © 2019 Smugglers' Notch Resort. All rights reserved.